Unlike many camera companies Hasselblad is named after its founder, who was Victor Hasselblad. The name Hasselblad is iconic and as a brand it stands for beautiful, well-built cameras with incredible optics. More than anything else, it has defined medium format for 75 plus years. Hasselblad’s beginning was with a large size aerial camera. Eventually Hasselblad released its first consumer camera, the 1600F, in 1948. The rest is history. The camera was a hit and over the years the Hasselblad line would grow, along with its reputation. In 1957 Hasselblad introduced the legendary 500C as a square format camera with leaf shutter lenses. This camera was the backbone for Hasselblad and even today defines Hasselblad with what photographers refer to as the V series of cameras. In the mid-70’s I was a young photographer in my 20’s and as my career grew I always believed that I would be super successful if I could shoot with a Hasselblad camera. My clients would know I was a pro and, in my mind, so would I. After many years of saving my money I finally was able to purchase 2 500cm cameras and 4 lenses. This was in 1977 (makes me seem old). I nestled these cameras in a big silver Halliburton case that had foam inserts custom cut for my cameras. I had arrived. My career did very well and the Hasselblad cameras served me well and took a real beating but always delivered. I remember my dad thought I was nuts for spending so much money for cameras but he just didn’t understand the photographer’s passion. As everyone knows, Hasselblad’s crowning achievement was having their specially modified cameras go to the moon. These cameras recorded iconic and historic images of our exploration of space in the 60’s, 70’s and beyond. It also changed things, as everyone then knew the Hasselblad brand. In 2002 Hasselblad took another giant step and released the H1 camera, the new camera system that was the foundation of the H5 system today. This camera was a departure in many ways. The camera was electronic and built for the new digital world that was rapidly changing everything photographic. It was also not a square format; it was a 6×4.5 otherwise known today as 645. Since 2002 many things have happened with Hasselblad. They were bought and sold a few times, had numerous CEOs and in the last few years made some questionable decisions in the eyes of the photographic community by rebranding third party cameras with their logo. Some might say this was blinging out normal consumer cameras and selling them for very high prices. Many wondered what was happening to their favorite iconic brand. Rumors persisted of Hasselblad’s demise and many wondered if Hasselblad would survive. A couple of months ago I received an email from Michael Hejtmanek, the US President of Hasselblad Bron. 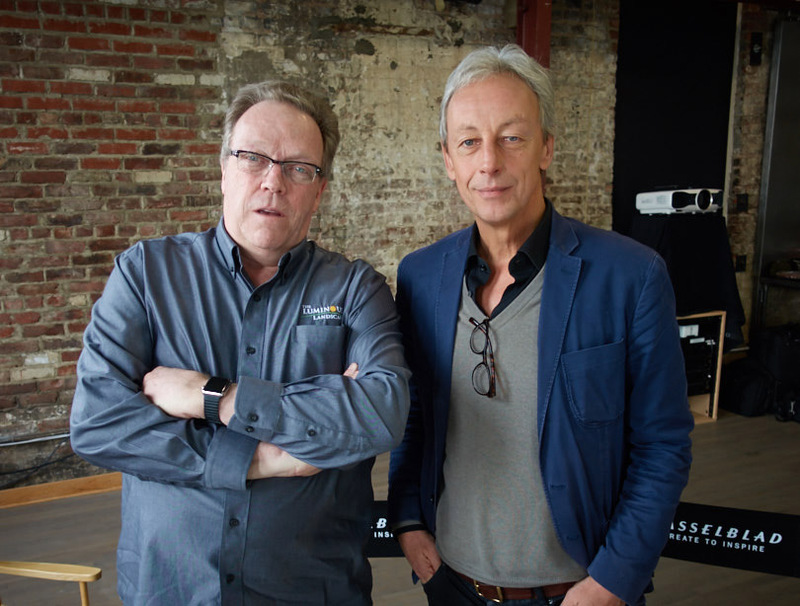 He asked if I would be interested in doing an exclusive video interview of the new Hasselblad CEO Perry Oosting. Of course I was interested. As the ball got rolling, Perry and I had an introductory phone conversation and subsequently set up a date to meet in NYC where we could sit down and talk Hasselblad. First impressions are important and upon meeting Perry prior to the interview I took an instant liking to him. He is a no BS kind of guy—warm, friendly and forthcoming. I expected a person all decked out in a suit and corporate, as that has been my impression of Hasselblad from the past. Nope, Perry was casual and laid back. We shared a cup of coffee and talked shop. Having been a Vice President with Phase One. I did have some inside knowledge of the workings of the medium format marketplace. This made it easy for us to get right down to business. Perry came on board as CEO just over a year ago. Hasselblad has been kind of quiet over that last 12 months except for two things that got the media’s attention. First, there was an investment into Hasselblad by DJI and then at the end of the year, Hasselblad significantly dropped the price of the 50 megapixel camera system. As expected, lots of speculation followed. So, obviously I wanted to know more about these moves and I believe our readers might too. Before we started the interview, I asked if there were any embargos, announcements or NDAs that can sometimes accompany an interview like this. Simple answer was no. Perry said he was hopeful that this was the first of a number of interviews and possibly the next might involve some papers to sign. This interview is around 40 minutes. You’ll learn some history, be introduced to Perry, and the challenges that Hasselblad faces and the things being done to position Hasselblad as a company and brand to meet these challenges. Perry is in a tough position. Hasselblad has stumbled over that last few years without a doubt. He has pressure from investors as well as customers to make changes and bring Hasselblad to the forefront of this industry. As you’ll hear, he has been very busy. He seems to have the energy and vision as well as what I consider the most important element–the knowledge to make a change. He is a very easy person to talk to and, while not telling us anything about unreleased products, he makes the point that there is a lot of activity going on behind the curtains at Hasselblad. Please enjoy our conversation together for what I hope will be the first of several sit downs with Perry Oosting this year.